The return of antiquities to Italy has been setting the agenda for discussion. The Polaroids seized in Geneva gave an advantage to the Italian negotiating teams. So what is happening to the Greek investigation? 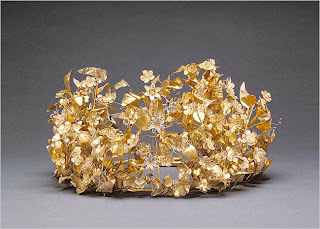 Gold funerary wreath. Formerly 93.AM.30. Inscribed tombstone of Athanias. Formerly 93.AA.47. Marble torso (kore). Formerly 93.AA.24. No doubt there have been distractions for Diotis such as the raid on Schoinoussa in which some 142 items were seized (Nicholas Paphitis, "Senior prosecutor takes over Greek island villa antiquities investigation", AP, April 14, 2006). But more than two years have elapsed since the Greek authorities were given the Polaroids. How many pieces have been identified? Have negotiations started? Gold wreath formerly in the J. Paul Getty Museum.